Forrest Hewit (1870-1956) was a very unusual character amongst his fellow artists. Whereas many of his contemporaries turned away from commerce or the professions to become painters, he was very successful in following both paths. Towards the end of the 19th century Manchester was one of the foremost centres of the cotton trade in which Hewit established a career in which he rose to the top and became a prominent member of important institutions and various committees. Alongside this illustrious career ran an equally successful life as an artist. Considering the above, it is no surprise to find that in this field he also became a prominent figure as an Honorary Vice-President of the Manchester Academy of Fine Arts. His paintings are extremely rare as the majority of his output was purchased for permanent collections worldwide. He exhibited widely at the Royal Academy from the outset of his career; the Paris Salon; the New English Art Club; the Royal Hibernian Academy in 1940 and extensively at leading venues throughout England. 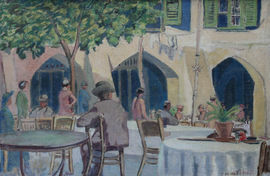 When he retired from commercial life he had the opportunity to increase his output, which allowed him to stage a series of one-man exhibitions at the New Burlington Gallery in 1936; the Grosvenor Gallery in 1937; the Manchester Academy in 1938; the Goupil Gallery in 1939; Salford, his birthplace, in 1943 and Royal Society of Painters in Water Colours in 1948. He first studied under Thomas Cantrell Dugdale who was probably responsible for his interest in French painting. He also studied under Walter Richard Sickert who had a profound influence on his painting.